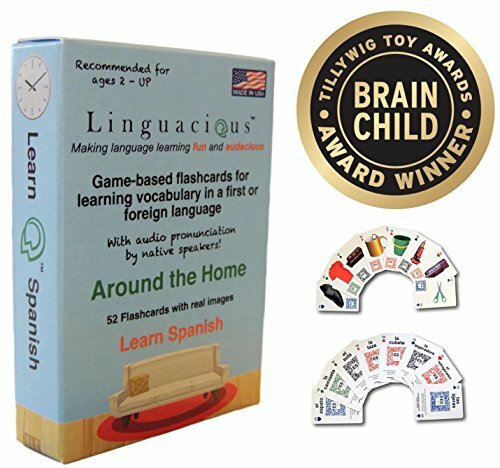 Linguacious Award-Winning Around The Home Spanish Flashcard Game - The ONLY One with Audio! These award-winning, trademarked, made-in-the-USA Linguacious flashcards were created by Ph.D. linguists and parents of bilingual children to bring families and language learners together for a fun vocabulary learning experience. The design of each of the cards follows scientific principles of language acquisition, such as input/output and practice of both passive and active word knowledge. Real images are used in all cards, to enhance the connection between the real worlds and the flashcards. All four language skills can be practiced with these cards: speaking, listening, writing, and reading and the flashcards can be used with children as little as one, as long as there is supervision of an older child or adult. Children aged 3 and older may use the cards on their own, although some of the games are more suitable for kids 5 and older. Languages and topics are constantly expanding. All Linguacious cards are manufactured and designed in the USA. This specific item is great both for kids whose first/native language is Spanish or for those kids who are learning Spanish as a second or foreign language. WINNER of the prestigious Tillywig Brain Child Award! Your child will learn reading, writing, listening, and speaking with these cards. MADE IN USA and a portion of our profits are donated to foster foreign language learning in K-12 in the USA. Our suggested games to learn Spanish (includes word bingo) are guaranteed to get you to learn all words in no time! 30-Day Money-Back Guarantee! If you have any questions about this product by Linguacious, contact us by completing and submitting the form below. If you are looking for a specif part number, please include it with your message. Linguacious Award-Winning Around The Home German Flashcard Game - The ONLY One with Audio!